A body recovered from the Irish Sea has been brought to Portavogie harbour in County Down by the fishing crew who discovered it in their nets. 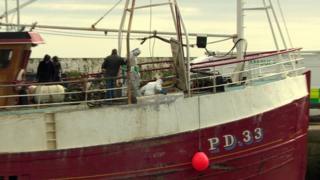 The trawler, Elegance, was fishing for prawns near the Isle of Man when the decomposed body became caught. The boat arrived back in Portavogie early on Tuesday. The crew and skipper are said to be very shocked. Police and forensic teams examined the boat and removed the body. The harbour master, Eddie Robinson, was called to the scene late on Monday night. "When I came down, there wasn't much I could do other than take care of the crew," he said. "I brought them down to our rest room, there was heating on for them and I got them settled in for the night. "These guys live on the boat. They had nowhere else to go. The Fishermen's Mission is looking after them now and they will take good care of them." Mr Robinson said the skipper of the boat was "badly shaken up" and the crew were shocked and "at sixes and sevens". He said the boat is operated by a local skipper. He said he believed most of the crew were from India.